Can't wait for Alex Smith to be singing his praises while lifting the Lombardi!!! IDK about that. That's a pretty bold statement. Yes, there were a couple of JAG's in 96 - 99, but for almost 40 years we have had a HOF caliber LT on the line. That is an amazing run. 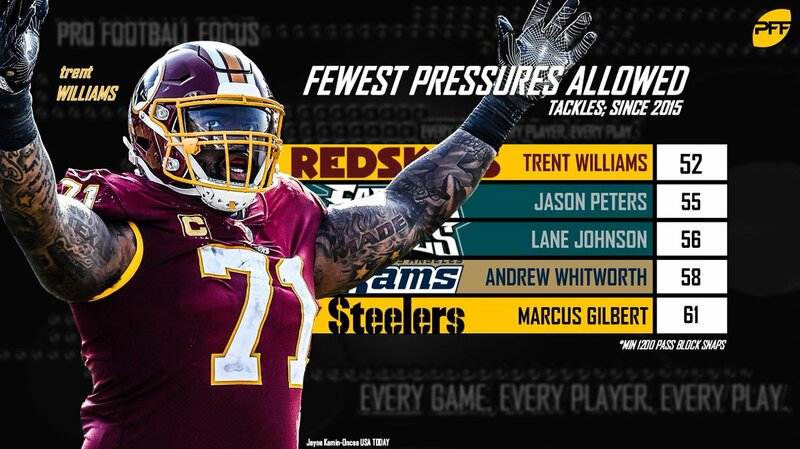 I feel like Chris Samuels and Trent Williams are two of my favorite Skins. Would love to see Trent get a ring; wish Samuels could have. The dudes are warriors. Yeah good for him. Congrats to him! Is it really though? Nobody can touch him in terms of his overall athleticism. While I tend to think it’s hard to make these kind of comparisons given changes to the game over time, no one can reasonably dispute that he’d be in the conversation for the top offensive linemen the nfl has seen. And we’ve had our fair share of them. Hope that trend continues.